Matilda's Horned Viper (file photo). Abubakar Ballah, the Officer-in-Charge of Snakebite Treatment and Research Centre, Kaltungo, Gombe state, has called on Nigerians to embrace snake rearing to enhance their economic status. Mr Ballah told the News Agency of Nigeria (NAN) in Kaltungo on Friday that snake rearing is one of the most profitable trades in the world. According to him, the high cost of snake venom used by pharmaceutical industries in producing anti snake venom has glorified the business. 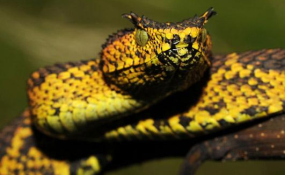 "An ounce of the venom of a Carpet viper snake is 500 USD, that of Cobra and Puff adder snakes cost 400 USD. "The good thing about the business is that you can find market easily through the internet," the official said. Mr Ballah said that apart from the production of anti snakebite venoms, the pharmaceutical industries use the snake venoms in the production of anti hypertensive, cancer and ulcer drugs. Besides selling the snakes to pharmaceutical firms, he disclosed that the reptiles could be sold to earn foreign exchange. "For example, Indonesia has the largest reservoir of snakes in the world, very beautiful, colourful and harmless, and the government of that country exports them to earn revenue," he said. "In the area of fashion, the skins of the reptile are used in the production of fanciful belts, ladies handbags, shoes and other items. "It is therefore ironical to see fashion-conscious people, dressed in shoes, belts and handbags made from snake skins, either having phobia for live snakes, or see the reptile as enemy number one," he observed. In the area of nature's own nourishment, the officer said snake meat is a favourite delicacy in some African and Asian countries. "They remove the venom and prepare special pepper soup, especially the python meat, which tastes like fish meat," he said. Ballah said in the area of agriculture, snakes help in balancing the ecosystem on farmlands by reducing the number of destructive rodents, thereby enabling farmers to enjoy bumper harvest. "Farmers do not go out at night to check their farms; snakes do that for them, as such the reptiles are supposed to be friends of farmers, not enemies," he added. He attributed the phobia for snakes by people to the awesome charisma of the elegant reptile, but stressed that snakes were harmless, and that they only bite in self-defence. "In most cases, it is only when it feels threatened that it bites, just like any human being will not hesitate to throw a punch at any enemy, real or imagined. "So more often than not, we have cases of people, either advertently or otherwise, stepping on snakes and the reptile bites back out of the instinct to protect itself. "That is why when a snake gets to hear any movement from far, it tries to run away but when pursued and placed in a tight corner, it reacts if it has the means to do so," he explained. On how to rear snakes considering that taming same is a herculian task, the officer said interested persons could either engage the services of snake charmers for a fee per snake, or engage in joint business with the charmers. He noted that Nigeria was blessed with varieties of snakes spread all over the country, as exemplified by what obtains in Kaltungo town of Gombe state. Ballah underscored the need to harness same and generate revenue at individual and government levels.